Unfortunately, usually, when it comes to the subject of having any form of intelligent, civil discourse, with any Atheist/Anti-Theist, concerning Theism vs. Atheism/Anti-Theism, it ends up being a conversation that always goes on tangents, which are the faults of both Theists & Atheists/Anti-Theists, who engage in these types of conversations, debates, arguments, etc. However, ironically, for Theists, Muslims especially, they never realize (until it’s too late, and when they’ve said all of the wrong things, either inaccurately or completely out-of-context) that it’s never about “winning” an argument with any Atheist/Anti-Theist. The objective is to simply not lose an argument with an Atheist/Anti-Theist. We, as Muslims, have to be very intelligent, tactful, and wise, whenever conversing with people of an Atheist/Anti-Theist disposition. However, one of the major things which Muslims, Theists, generally, get caught-up with, when conversing with Atheists/Anti-Theists, is the whole “Scientific-Fallacy”…I’ll explain what I mean by “Scientific-Fallacy”. Whenever Atheists/Anti-Theists converse with those who are Theists, they always, in order to dominate the conversation, drag the issue into the realm of Science, and then challenge people like us to formulate a Divinity-Theory/Law, in which we’re then pigeon-holed into trying to prove the existence of Allah via the “Scientific-Method”. And, ironically, sadly, we fall for this entrapment, every time/all of the time. Make the point that by using the “Scientific-Method”, to attempt to “prove” the existence of a “Divine-Creator”, is self-admission that Allah: the Creator/Lord of the Universe thus exists within the confines of the Physical-Universe. Now, we as Muslims, we know, based upon what Allah teaches us, in the Qur’an, that the Universe has 2-Dimensions: Physical & Non-Physical. Now, with Allah being who He is, we know that there is no way that He can possibly exist within either Dimension of the Universe, because He is Eternal/Non-Created: existing with neither a Beginning nor an Ending. Also, you can only use the “Scientific-Method” to detect the Existence of Things which exists within the confines of the Physical-Universe, and since this is the case, you cannot use the “Scientific-Method” to prove the Existence of Allah, and Atheists/Anti-Theists know this fully well. But, they also know that it’s so easy to trap-up Theists, who are not on to their entrapment. So, because one cannot use the “Scientific-Method”, to prove the Existence of Allah, that’s what Revelation is for. However, the Problem is that Atheists/Anti-Theists don’t recognize, respect, or accept Revelation. 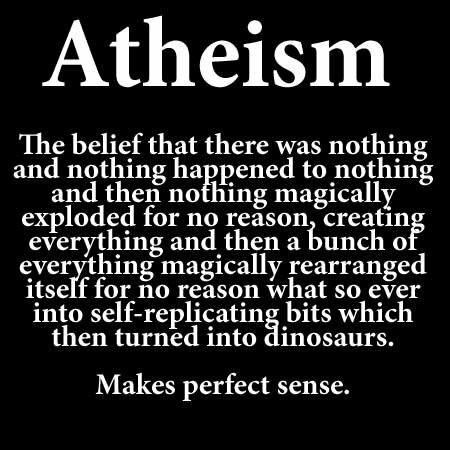 Basically, it gets to the point of the Atheist/Anti-Theist point of view having nothing to do with anything Scientific. One of the other things that they challenge us to do is to disprove all of the “Scientific-Proofs” of things like “Evolution”. Even though, ironically, there still isn’t any definitive proofs for almost all of the elements of “Evolution”, “Darwinian-Evolution”, particularly, which clearly explains why generally, largely, “Evolution” is still, til this very day, classified as merely a “Scientific-Theory” as opposed to a “Scientific-Law”, especially in terms of determining the Origin of Man. And, if a Theist, a Muslim, especially, says that they even accept all that they interpret Science to be, which would include “Evolution”, but, that Allah is the one who is Responsible for all of what “Evolution” states takes place within the Universe, you will be plainly called “Wrong” by any Atheist/Anti-Theist, just because you testify that a Divine-Creator is Responsible for all that exists. And, this also proves that Atheism/Anti-Theism is an `Aqidah/Theology, because they believe in the non-existence of a Divine-Creator-even though they claim that Theists cannot provide proof for the existence of a Divine-Creator, they themselves do the exact opposite; but, ironically, they have no Proof: Empirical/Scientific Evidence for what they claim is the non-existence of a Divine-Creator. Also, one of the key things which Muslims must be careful of are the classic “Spin-Off Arguments” which Atheists/Anti-Theists love to use to make Muslims, and Theists generally, look really Stupid. Typically, almost always, a Muslim/Theist in general, would say that nothing comes from nothing, that all which exists has an Origin. But, then, an Atheist/Anti-Theist would attempt to trip you up, and spin that Argument right back around towards you & then challenge you, as to why is it that Allah has no Origin, yet everything else does. And, the only way to dispute those varied “Spin-Off Arguments” is to simply use Revelation, which, unfortunately, they will deny. Honestly, that’s really the only edge that we, as Muslims, have over Atheists/Anti-Theists, Revelation: Islāmic-Texts (The Qur’ān & Sunnah/Prophetic-Tradition. Simply from a Human-Level, we’re only 50/50 when conversing with Atheists/Anti-Theists, without referring to Revelation. Without the mercy & gift of Revelation, it is not at all possible to prove the Existence of Allah definitively. And, when it comes to the Belief in a Divine-Creator, when compared to the Disbelief of a Divine-Creator, with Revelation aside, we’re only at 50/50 with Atheists/Anti-Theists. Meaning, they can only disbelieve in a Divine-Creator, but, they have absolutely no Empirical/Scientific Evidence that a Divine-Creator doesn’t exist, it’s just that they’ve now replaced a Divine-Creator with their Intellect, Egos/Desires as their own Gods. While for us, without Revelation to substantiate our Belief, that’s all that it is, a Belief. And, this is why knowledge of Islam is so important for us to learn, know & live. This is not the only way to combat, ward-off Atheism/Anti-Theism. However, if one had no Idea how to, previous to reading this Article, then, I’m pretty confident that, with Allah’s Help/Guidance, this will empower Muslims with the Necessary-Tools to keep Atheists/Anti-Theists at bay, so as to not allow their Beliefs (rejecting the Existence of a Divine-Creator) to cause Doubts in the purity, authenticity of our Islamic-Beliefs. Oftentimes, almost always, both Atheists (who deny the validity of believing in any Divine-Creator) & Anti-Theists (who are blatantly against even believing in the existence of any Divine-Creator) respectively, place their claims that the existence of any Divine-Creator is non-sense, or silly at best, because they claim that no religion can empirically prove the existence of any Divine-Creator. Well, I have such proof of the existence of a Divine-Creator, directly from the speech of the Divine-Creator, it’s in the Qur’an itself. Allah clearly states in the Qur’an, concerning the metal Iron: “We have descended Iron, within it contains great durability, as well as benefits for Humans.” (Chpt. 57, V. 25). Now, for those who are scientifically inclined and/or educated in the field of Science, you would know that there have been numerous studies which have proven the fact that tons of amounts of Iron deposits, in the forms of meteors, meteorites, meteoroids, asteroids, etc. have descended to the Earth, during various points in the history of the Earth itself. The most popular scientific opinion concerning the origin of Iron coming to the Earth is via meteorite showers that pummeled the Earth’s surface, before it became solidified, and thus became part of the Earth’s core, as well as part of the Earth’s crust. Now, for those who deny the legitimacy of the existence of Allah, the Creator of the Universe and/or the Qur’an as a factual book of revelation, I ask you the following question: How is it possible for someone like the Prophet Muhammad (Peace be upon him), who was well-known in his society for not receiving a formal education, and for being completely illiterate (who is also mentioned directly in the Qur’an as being illiterate [Chpt. 7, Vs. 157 & 158]), going to have such sophisticated knowledge about Iron & how it came to the Earth originally? The answer is right in front of your faces, he was directly inspired by Allah, through the revelation of the Qur’an, and was given knowledge about this particular event of Iron descending to the Earth, 14 centuries before any other Human being ever discovered the origins of Iron via scientific analysis & research. Even though Allah does not go into detail as to exactly how this event took place, the fact that Allah does in fact mention it at all is very significant, especially when it comes to debunking the erroneous belief that no Divine-Creator exists. Now, I’m not trying to convince anyone who is an Atheist or Anti-Theist to just give up their respective beliefs (by the way believing that there is no Divine-Creator is a belief in and of itself) just on my account, that would be a decision which you as an individual would have to make consciously on your own. However, I am most definitely here to tell you, as a Muslim, as an intelligent Human being, that not only is denial of the existence of the one who created you a personal offense to Him, but it’s just down-right dumb!!! How do you think you got here, just by an accident?!!! Do you really think that everything in the Universe, with all of its wonderful intricacies & complex orderly systems just got here, with no one to bring it into being and to ensure its maintenance?!!! I’m simply imploring you (those who may be reading this who may in fact be Atheists or Anti-Theists) to use the intellect that Allah, the Creator of the Universe has given you!!! If you are still willing to be an Atheist and/or Anti-Theist, after this simple proof has been presented, in this modest blog post, well then I guess Rick James was absolutely right when he said, “Cocaine is a hell of a drug!! !”.